The lights work only with the ignition on, unless otherwise stated. 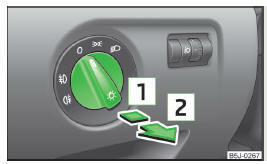 The layout of the controls on right-hand drive vehicles partially differs from that shown in » Fig. 40 on page 56. The symbols which mark the positions of the controls are identical. Never drive with only the side lights on! The side lights are not bright enough to light up the road sufficiently in front of you or to be seen by other oncoming traffic. Therefore always switch on the low beam when it is dark or if visibility is poor. The activation of the lights should only be undertaken in accordance with national legal requirements. The driver is always responsible for the correct settings and use of the lights. The headlights may mist up temporarily. When the driving lights are switched on, the light outlet areas are free from condensation after a short time, although the headlight lenses may still be misted up around the edge. This mist has no influence on the life of the lighting system. Light switch positions » Fig. 40.
position, the ignition key is removed and the driver's door is opened. The audible warning signal is switched off by means of the door contact when the driver's door is closed (ignition off), however, the side lights remain on to illuminate the parked vehicle if necessary. Always turn the light switch to the 0 position if you are leaving the vehicle and don't want to use the parking light. headlight beam thereby shortening the beam of light. The positions of the rotary switch correspond approximately to the following car load. All seats occupied, boot empty. All seats occupied, boot loaded. Driver seat occupied, boot loaded. Always adjust the headlight beam to satisfy the following conditions. The vehicle does not dazzle other road users, especially oncoming vehicles. The beam range is sufficient for safe driving. We recommend you adjust the headlight beam when the low beam is switched on. Turn the light switch to position 0 » Fig. 40 on page 56. Activate and deactivate the daytime running lights by fitting/removing the fuse with the appropriate ampere rating for daytime running lights » page 167, Fuses in the dash panel. At the same time, pull the turn signal light stalk » Fig. 42 on page 58 towards the steering wheel, push it downwards, and hold it in this position. Switch on the ignition - wait until the left-turn signal light flashes 4x. Switch off the ignition - an audible signal sounds which confirms the deactivation of the daylight driving lights. Release the turn signal stalk. At the same time, pull the turn signal light stalk » Fig. 42 on page 58 towards the steering wheel, push it upwards, and hold it in this position. Switch on the ignition - wait until the right-turn signal light flashes 4x. Switch off the ignition - an audible signal sounds which confirms the activation of the daylight driving lights. On vehicles with separate lights for daylight driving lights in the fog lights or in the front bumper, the parking lights and the licence plate light do not come on when activating the function daylight driving lights (neither front nor rear). If the vehicle is not equipped with separate lights for daylight driving lights, the combination of the low beam, the parking lights (front and rear) including the licence plate light is used as daylight driving lights. In vehicles with separate lights for daylight driving lights (in the bumper below the main headlights) these lights also serve as side lights. 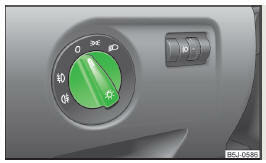 The parking light is controlled with the control stalk » page 60. Control stalk positions » Fig. 42. Turn signal for changing lanes - to flash only briefly, move the stalk up or down to the pressure point only and hold it in this position. If you wish to flash three times only, briefly push the stalk to the upper or lower pressure point and release again. Only turn on the main beam or the headlight flasher if other road users will not be dazzled. The main beam can only be switched on when the low beam lights are on. 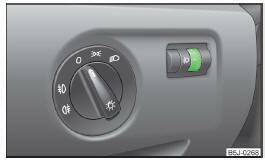 The headlight flasher can be operated even if the ignition is switched off. 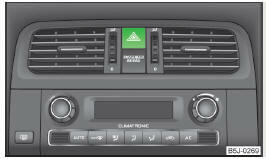 The turn signal system only operates when the ignition is switched on. The turn signal is automatically cancelled after negotiating a curve. The warning light flashes at twice its normal rate if a bulb for the turn signal light fails. For a better cornering illumination, the halogen projector headlights with cornering light function are set in the optimal position in line with the vehicle speed and the steering angle. If the halogen projector headlights with cornering light function are faulty, the headlights are automatically lowered to the emergency position, which prevents a possible dazzling of oncoming traffic. Thus the illuminated length of the road is shortened. Drive carefully and visit a specialist garage as soon as possible. Pull the light switch to position 1 . The rear fog light is switched off in the reverse sequence. in the instrument cluster when the fog lights are switched on » page 35. The CORNER function lights the front fog lamp on the relevant side of the vehicle to illuminate the area around the vehicle when turning, parking, etc. The CORNER function is switched on automatically if the following conditions are met. The turn signal is switched on or the front wheels are turned sharply to the right or left1). The vehicle is stopped or is travelling at a speed of no more than 40 km/h. The low beam is switched on. The daytime running lights are not switched on. The fog lights are not switched on. Reverse gear is not engaged. Pull the light switch to position 2 .
to the position 2 . This switch can only be pulled into one position. in the instrument cluster when the rear fog light is switched on » page 35. Only the rear fog light on the trailer lights up if the vehicle has a factory-fitted towing device or a towing device from ŠKODA original accessories and it is driven with a trailer. This mode makes it possible to drive in countries with opposing traffic system (driving on the left/right) without dazzling the oncoming vehicles. When the mode “tourist light” is active, the side to side swivel of the headlights is deactivated. Before activating the tourist light, the following conditions must be met. position, no gear engaged or selector lever in the N position (automatic gearbox), tourist light deactivated. position » page 56, Parking and low beam lights. Before deactivating the tourist light, the following conditions must be met. position, no gear engaged or selector lever in the N position (automatic gearbox), tourist light activated. each time the ignition is switched on. All the turn signal lights on the vehicle flash at the same time when the hazard warning light system is switched on. The warning light for the turn signals and the warning light in the button also flash at the same time. The hazard warning light system can also be operated if the ignition is switched off. 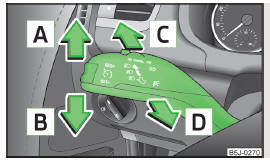 The hazard warning light system will switch on automatically if one of the airbags is deployed. Switch on the hazard warning light system if, for example, the following occurs. You encounter a traffic jam. The vehicle has broken down. Pull the turn signal stalk » Fig. 42 on page 58 upwards or downwards - the side light on the right or left side of the vehicle is switched on. only be activated if the ignition is switched off. If the right or left turn signal light has been switched on and the ignition is switched off, the parking light is not automatically switched on.